Ahwatukee is an urban village located in Phoenix, Arizona. It has a population of 77,249 residents and rests on 35.8 square miles of land. Ahwatukee is a beautiful village that is surrounded by South Mountain Park and because of its low number of entry points it’s referred to as the world’s largest cul-de-sac. Because it’s cut off from most of the surrounding areas, residents feel a friendly small town atmosphere. There are many outdoor recreational areas close to Ahwatukee because of its strategic location near South Mountain Park and a Phoenix City Park. Residents have access to hiking, biking, volleyball, golf, and soccer. There are many beautiful homes in the village and they mainly consist of being single family homes. The median home value is $307,100. The home value rate has risen by 0.6% in the past year and it’s predicted to rise by another 2.1% in the coming year. 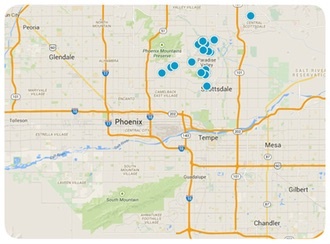 The median price per square foot is $150 and this is higher than Phoenix’s median of $126. If you are interested in purchasing a home in Ahwatukee, contact us today for more information.